Covered bridge, originally uploaded by jahansell. We had just under 1/2" of rain here this morning, which brought the river up a little, to 1040 cfs. This has not affected the fishing at all. Same action as yesterday, only warmer today. Tomorrow, too. Caddis and Grey Fox still best bet . More mayflies any time, keep your eyes open. Tight lines . Unusual to see a bridge like this. Handy if it's raining. 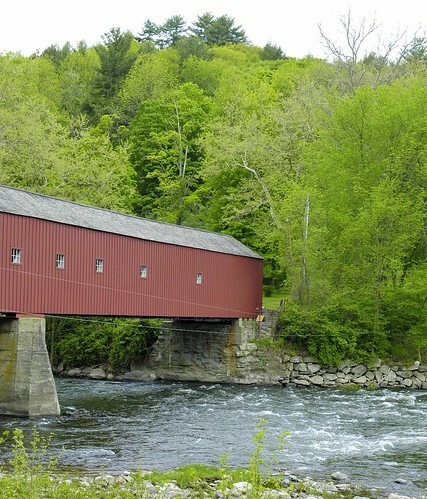 Last year I went to Cornwall (West de Cornwall) the Covered bridge is very attractive with this color, then direction In West Cornwall, The Wandering Moose Cafe is situated just off to the side of the covered bridge,the meals are very good and very pleasant environment. Nice covered bridge and the water looks nice for just having a lot of rain. Our rivers would be muddy brown. Their beaks close, their eyes shut and their heads flop over the edge of the nest. American Robin series starts today in Brookville Daily Photo. I think "Ponte Vechio", Florence, I think Bath, England....but in fact, neither of them are entirely closed like your one is. So, now I'm wondering which Cornwall exactly is Monique referring to...Anyway, I've never ever seen a covered bridge, must less imagined one.